In this episode, some adorable Yokomon and the heart-warming friendship between Sora and Biyomon shield us from the dark, horrible universe we all are trapped in. This is indeed a most disturbing Digital World. And all the Lovecraft allusions don't even kick in until season two. 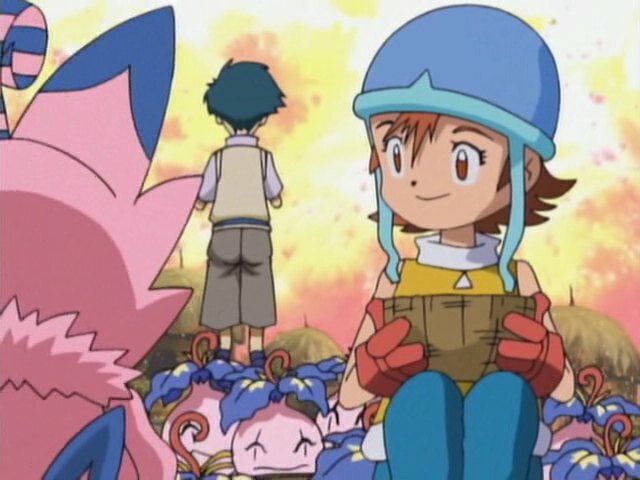 It's one of several unsettling moments today, which is pretty full of them for an episode about the loving relationship between Sora and Biyomon and their efforts to save all those cute little Yokomon from the volcano they so ignorantly settled next to. First off, the endless walking through territory unfamiliar is giving our team a nice case of the crazies. They're out of food, out of water and traipsing through the forest of random road signs and the desert of random telephone poles. Everybody's losing it, to the point where Mimi's whining just sort of blends in with everything else. She actually has a nice selfless moment where she lends Palmon her hat, so let's give her credit for that. It's clear this was going to be a Sora episode right off the bat when she pauses to give Biyomon an “it'll be fine if we stick together” speech as the rest of the team walks away from that noise. They know she's right, but they must all be driving each other insane by now and would love to just get away from the rest of these clowns for a while. So just as Mimi loses her mind, Biyomon loses her energy and Matt loses patience and is ready to mutiny his way back to road sign land, they find their adventure of the week- a Yokomon village whose water supply is interrupted by GUSHING FIRE. In the meantime, Biyomon explains all the cool powers she's getting teaming up with Sora. Sora's quietly loving this, and she seems to accept Biyomon as a BFF before any of the others are really sure what this whole partner thing is about. Tai sees Agumon as an interesting new buddy, Matt sees Gabumon as a protector for him and his brother, Izzy sees Tentomon as a colleague, Mimi sees Palmon as a curiosity, TK sees Patamon as a talking pet and Joe's wondering who the hell thought it would be funny to give him Gomamon. They all get better, of course, but Sora and Biyomon seem to be making a serious connection already. Good for them. It still brings up the most disconcerting part of the episode (other than Meramon): Sora states that they are somehow lucky kids for having guardians that respond to them being in physical danger. Being in a world where they are constantly in physical danger (and often hungry, thirsty, tired and losing their minds) is not lucky. The least the world can throw them is a fighting chance. This'll be worth revisiting when we get to Frontier and Xros Wars (the other seasons where they enter the world involuntarily) to see if the kids take Sora's mindset or are all about getting the hell out of there... before that sense of purpose and duty kicks in of course. The episode itself... meh. It's fairly standard “rescue the innocent, get a new evolution” business, balanced out by all the dark layers and the slightest hint of a recurring plot. 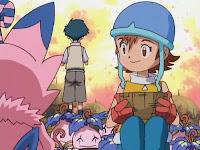 I found Sora and Biyomon's bond sweet in this episode, but we all know those two stray towards sappy pretty quickly. This is the first time we get a Champion despite their partner not being in much more danger than anyone else. How lucky for them. Anyone who wants to accuse the show of having lousy voice work can point to this episode. It starts with Sora's “Wh... hey!” like an amazon that just got robbed from under her nose. There's all sorts of weird notes in this episode that don't sound quite right. Stay perfectly silent and perfectly still! It's an awful, awful strategy in this scenario, but in journalism school we're taught to write to the pictures and sure enough we get lazy, still-frame shots of panic during Meramon's charge. Silly dub. Lemmings do not actually charge off cliffs in packs. Yokomon on the other hand... keep Mufasa and Simba away from those things. Remember in episode two when it was established that Digimon can't evolve while hungry? Wasn't Biyomon starving with everybody else? 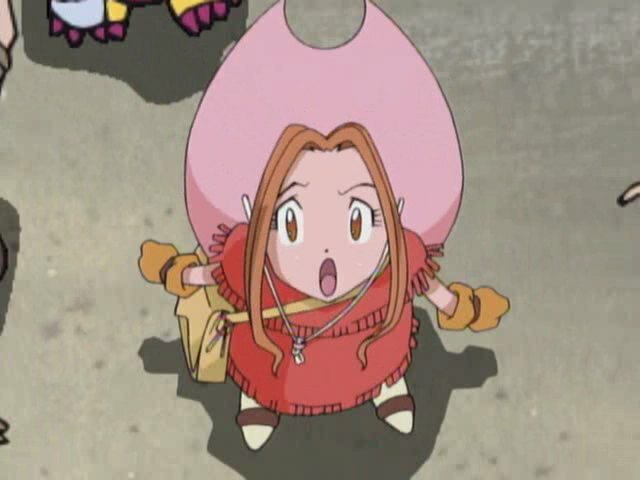 Got to admit, when it came to the regular Digimon characters, Biyomon was the first one that I began to enjoy. BTW, anyone else think Gizmonic Institute (the company Joel and the Mads worked at in MST3K) upon seeing the gear (also, no mention that this episode starts the involvement of Digimon becoming corrupted thanks to said gears)? The gears were the "slightest hint of a recurring plot." That's all they really are at this point... hope. Was anyone else FREAKED THE HELL OUT by the fact that Meramon's mouth was STITCHED SHUT? And apparently this is something he just lives with? No mouth and must scream, indeed. 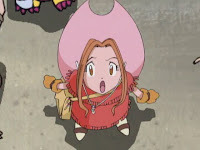 Was anyone else ever confused about the number of Yokomon? The village looks like it could hold a few dozen (maybe a hundred), there's about two hundred who roll out the welcome wagon, well-over a thousand charge off the cliff, and then were back to under two hundred at dinner. Makes writing a rewrite of the battle scene really screwy. Possibly the weakest episode yet, though it actually had the best enemy Digimon we'd had up to this point. Meramon's design, the fact that he can actually talk, and the issue with the Black Gear made him instantly more memorable than the generic monsters who endangered our heroes in the previous three episodes. Sora's also a lot of fun to watch in this one. The dub yet again gave a weak script for this one. That "We're lucky kids!" part? Not what Sora originally said. 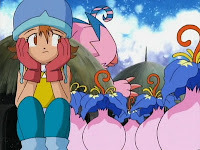 She was DENYING the possibility that the Digimon were their guardian angels, because that was just a silly idea to her. In general, the script fucked up Sora's characterization here - she's very focused on being self sufficient and providing for everyone, all on her own, and she's friendly without being "buddy buddy" with anyone. 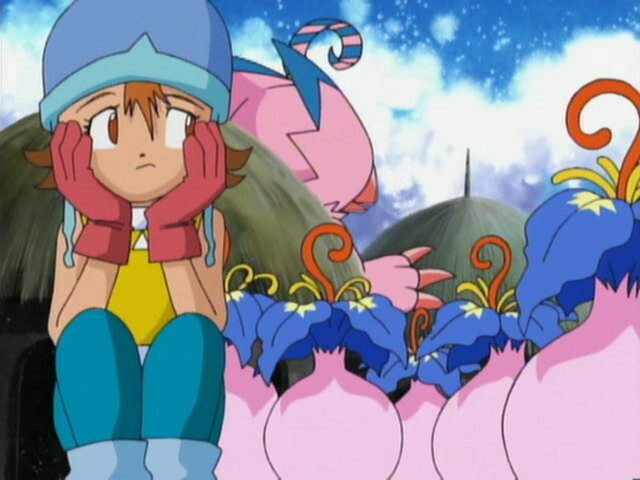 So Biyomon's differing position and demeanor was constantly annoying her. Turning Sora into a warm, friendly, optomistic team player with no real problem with Biyomon killed the central internal conflict of the episode and made a lot of Sora's later character focus moments make no sense to viewers, you included, as of episode 26. Just...really awful job, Saban.